The building of a ship, with its mass of steel and specialist fitting needs, takes a great deal of organisation and good management. Performed in a specialist facility known as a shipyard, a heavy workforce, some of which may be contractors, will work together to construct and fit a ship of any type. The trades employed, such as metal workers, electricians, carpenters, will be coordinated to make the best use of everyone’s time and get the ship built as quickly and as safely as possible. With relatively little automation, shipbuilding remains a relatively highly-skilled and labour intensive process. The average number of manhours required for the production of a ship varies from 300,000 to 1.5 million and production for a cruise ship or a liquefied natural gas carrier could take two years or more. 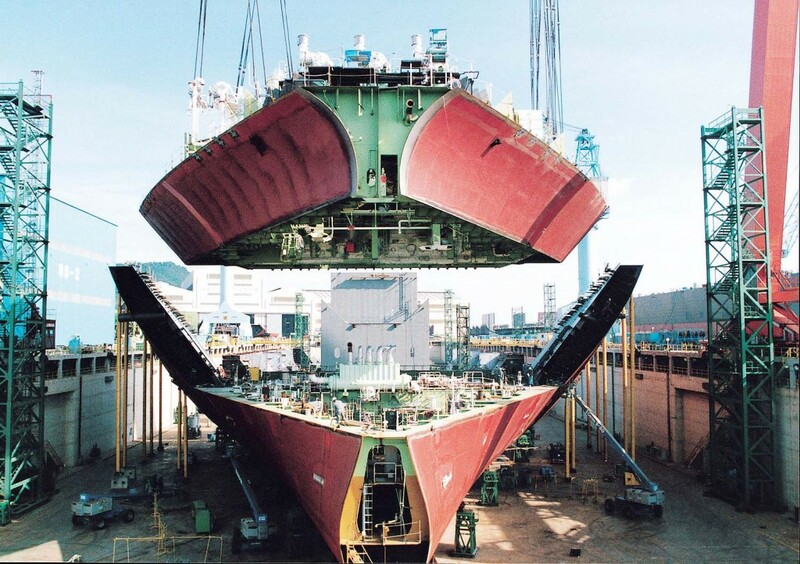 More and more, modern shipbuilders are making considerable use of pre-built sections, building entire multi-deck segments of the hull or superstructure elsewhere in the yard and then transporting to the dry dock or slipway to be lifted into place. Known as block construction, this process considerably speeds up construction time.